A growing source of silent era film information. This listing is from The Progressive Silent Film List by Carl Bennett. Copyright © 1999-2019 by Carl Bennett and the Silent Era Company. Frame enlargement: Silent Era image collection. Goskino production. / Scenario by Sergei M. Eisenstein and Nina Agadzhanova-Shutko. Art direction by Vasili Rakhals. Assistant directors, Grigori Aleksandrov, Aleksander Antonov, Mikhail Gomarov, A. Levshin and Maxim Strauch. Cinematography by Eduard Tissé and V. Popov. Edited by Sergei M. Eisenstein and Grigori Aleksandrov. Original music score by Edmund Meisel. / Premiered 21 December 1925 at Bolshoi Theatre in Moscow, Russia, USSR. / Standard 35mm spherical 1.33:1 format. / The production was shot in seven days and edited in another twelve days. Eisenstein’s third film. The film was banned by the British Board of Film Censors in 1926. 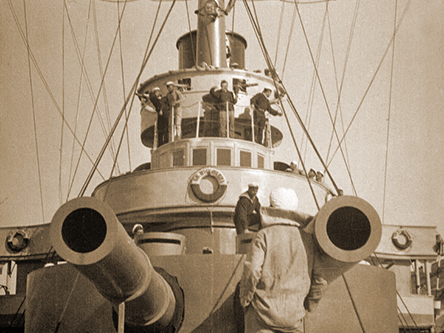 Synopsis: In 1905, a battleship’s crew mutinies against the oppression of the ship’s Imperialist officers. In Odessa, the sailors inspire the citizens to make a stand. Survival status: Prints exist in the Filmmuseum Berlin film archive [35mm restoration negative, 35mm restoration positives]; in the National Film Archive of the British Film Institute film archive [Film Booking Office version (circa 1926), and London Film Society version (1929)]; also elsewhere [35mm preservation positive, 16mm reduction positives, 8mm reduction positives]. Listing updated: 18 August 2010. References: Film credits, film viewing : Bardèche-History pp. 105, 174, 179, 188, 258a, 266, 270, 271-273, 274, 275, 354; Bohn-Light pp. xxiii, 137, 138, 139, 143-144, 145, 146, 148, 150, 154, 159, 160, 373, 374; Brownlow-Parade p. 413; Card-Seductive pp. 52, 66, 67, 78, 82; Everson-American pp. 144, 174; Gallagher-Ford p. 181; Geduld-Birth pp. 39, 147; Kael-Kiss pp. 55, 273, 333-334, 357, 358; Kerr-Silent pp. 8, 25, 44; Lahue-Collecting pp. 32-33, 39; Leish-Cinema pp. 39-40, 41, 43; Limbacher-Feature p. 192; McGhee-Wayne p. 195; McIlroy-Ireland pp. 32, 53; Perry-British p. 52; Robertson-British p. 186; Ryall-Blackmail p. 61; Sarris-Sternberg p. 11; Shipman-Cinema pp. 6, 89; Sinyard-Silent pp. 8, 9, 165, 167, 189; Sklar-Movie pp. 87, 155; Sloan-Loud p. 75; Wood-Hitchcock pp. 207, 210; Youngblood-Soviet pp. 46, 54, 65, 83, 85, 86, 88, 104, 109, 111, 113, 131, 158, 174, 175, 180, 201, 230, 233, 265, 317.